There are several on-line and store front operations which provide RCMP Foundation approved items for sale. The Mountie Shop – is the operated by the RCMP Foundation which contributes a portion of the profit from sales to various RCMP Community Policing initiatives across Canada. In addition to the on-line store, they also operate three store front operations at: The RCMP Musical Ride Center at “N” Division in Rockcliffe Ontario; RCMP “HQ” Ottawa; and RCMP’s Pacific Regional Training Centre in Chilliwack, British Columbia. – Check this store out at www.themountieshop.ca. RCMP Vets Canteen – Edmonton RCMP Veterans’ – operates this on-line store and all proceeds from the sale of their items are used to support various community initiatives. Mountie Store – is an on-line business in close partnership with the RCMP Veterans Association in southwestern Ontario. The majority of their profit is used to support various community activities. NEW – Personalized Mounted Police Crest Plates – Glass Treasures by Bonnie Saunders has many RCMP plates for presentations. Their products are “Official products under license from the RCMP Foundation.” Check out their webpage here. Vancouver Division Gift Shop – The Vancouver Division of the RCMP Veterans’ Association has established a mail-in Gift Shop. 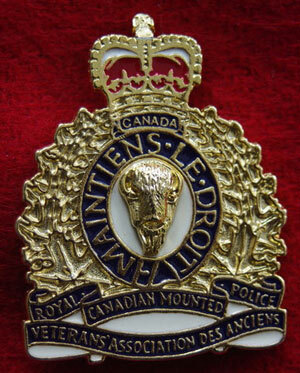 The Gift Shop provides RCMP Veteran related items to retired members of the Force and to the general public. Items available from the Vancouver Division Gift Shop are outlined below. If you wish to order any of the items, please telephone Gord Cave at 778-688-6181 or email him at jag140@telus.net.